White Clay Powder In All Its Glory! Here at Wake Foot Sanctuary, we get giddy over the ingredients we use in our soaks. As you kick back and relax in bubbly goodness, we believe the ingredients’ therapeutic properties really enhance your experience. 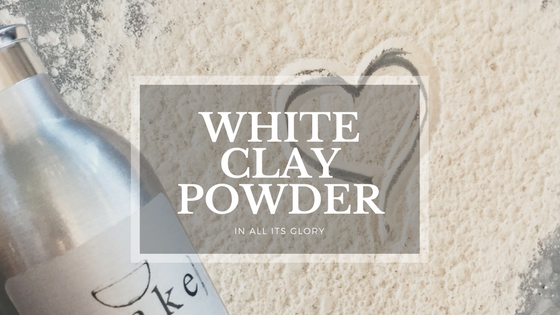 One of the ingredients that we adore is white kaolin clay powder. It is the main ingredient of some of our foot soaks. The ingredient is also found in our foot powder which is used at the very end of the foot soak service. If you like a soft, silky feel on your toes then read on to learn about the wonderful benefits of this magical powder. It is a clay that comes from chemical weathering of rocks in hot and moist climates. The main mineral in it is kaolinite. It is a light, fine and fluffy clay that makes it the perfect addition to our blended foot powder and foot soaks. It is typically the main ingredient you will find in commercial clay facial masks. It comes in a variety of colors ranging from yellow, white, or red depending on the mineral makeup. It is thought to have been the first substance used to make pottery. Where does kaolin clay powder come from? The rocks that form into kaolin powder can be found all over the world from China to Europe to the U.S. It was originally discovered in China and named after the hill where it was mined. Why is white clay powder used at Wake? It is made up of a wide range of minerals that have amazing benefits to the skin. The texture is soft and silky which is perfect for our soaks and foot powder. The clay has amazing benefits for your skin. What are the benefits of using kaolin clay powder? It is excellent at absorbing excess oil while still keeping the skin smooth and silky. White clay powder is great for detoxifying the skin as well. It has certain unique minerals that gently cleanse and purify the pores without causing redness. Kaolin clay is a great exfoliant for a face mask, as well. You can add a bit of water and make a paste to exfoliate the skin. This particular clay has a high amount of silica that aids in removing dead skin. It is incredibly soothing as it can be used to treat some skin conditions, inflammation, bruises, insect bites and small minor cuts. It enhances the blood circulation to promote healing. What are some other uses of this clay powder? Overall white clay powder such as kaolin can be a great natural alternative to commercial beauty and health products. It is inexpensive and is FDA approved. It can be used as toothpaste to whiten your teeth as it is really good at absorbing excess debris. It can be used as a hair mask to promote hair growth. Used regularly in a bath, it can nourish skin and clear out clogged pores. It is also very grounding, so, if you had a stressful day it is helpful at bringing you back to a calm and peaceful state. Did you know that kaolin has some internal benefits? If ingested, kaolin is known to be highly effective in helping with digestive issues and ailments. Because the clay does not break down it coats the inside of the digestive tract allowing tissues to heal. Caution must be used if you decide to use clay powder internally, as ingesting too much can make the body difficult to absorb nonessential minerals because of how well it coats the lining of the digestive system. How can I experience this magical powder? White clay powder can be found in our Clay Bath foot soak as well as in our foot powder used at the end of every foot soak service. As always, check with your doctor before using this or any clay powder in your health regimen.